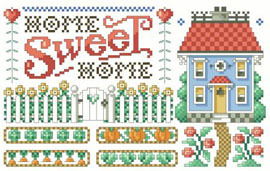 Home is where your garden grows in this Home Sweet Home sampler. It’s a different take on more traditional samplers. It would make a thoughtful gift for a loved one with a “Green Thumb”. Contents: Stitch Count 113w X 69h, Finished size on 14ct: 8" x 5"